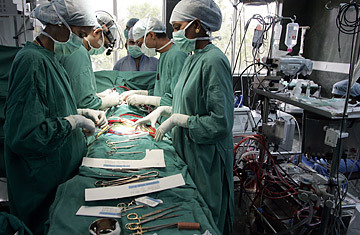 Open heart surgery is carried out on a baby at the Narayana Hrudayalaya Institue of Cardiac Sciences in Bangalore, India. Earlier this month, the insurance company WellPoint announced a program that will allow employees of a Wisconsin printing company to get coverage for non-emergency surgeries in India. It's a first for WellPoint, but puts the insurer in good company. Over the past few years, some U.S. insurance companies  dismayed at losing income from uninsured Americans who get cheap surergies abroad or clients who choose to pay out of pocket for discount foreign surgeries rather than expensive in-network co-pays  have announced plans to include foreign medical procedures among those covered by health plans. In recent years, companies all over the U.S. have sprung up to guide Americans through the insurance and logistical hurdles of surgery abroad, including many in U.S. border states affiliated with medical facilities in Mexico. The physician-managed MedToGo in Tempe, Arizona, founded in 2000, says its clients save "up to 75% on medical care" by getting it in Mexico. The Christua Muguerza hospital system  located in Mexico, but run by U.S.-based Christian hospital group since 2001  includes a scrolling text box on its web site informing visitors how "very close to you" its Mexican facilities are. ("from Houston 1 hr 37 mins!" "from Chicago 3hrs 15 mins!") Meanwhile, New Zealand is trumpeting its expertise in hip and knee replacements and South Korea is enticing medical travelers with high-end non-medical amenities like golf. For those who wrinkle their noses at the thought of going under the knife in a foreign, let alone still-developing, country, the American Medical Association introduced a set of guidelines in June for medical tourism. The AMA advocates that insurance companies, employers and others involved in the medical tourism field provide proper follow-up care, tell patients of their rights and legal recourse, use only accredited facilities, and inform patients of "the potential risks of combining surgical procedures with long flights and vacation activities," among other recommendations. Joint Commission International, a non-profit that certifies the safety and record of hospitals, has accredited some 200 foreign medical facilities, many in Spain, Brazil, Saudi Arabia, Turkey and the United Arab Emirates.